During a recent session at the Paris Android User Group (hi PAUG!) we did a live coding of a ViewPager example, it took around 5 minutes. What is a ViewPager? It is a tasty new class smothered in awesome sauce on a bed of rocking adapters, seriously I think I may use at least one in every Android app I make from now on. It was released as part of the updated Compatibility Package. White on green was a great choice, right? very.... visible. If you search for 'android view pager' you'll see many questions on how to implement smooth, finger tracking, horizontal view paging in Android, so it seems appropriate the solution is called ViewPager. ViewPager was launched at the end of last week as part of the updated Compatibility package and supports Android 1.6+. Some of you may have been aware of the Workspace example open sourced with the I/O Sched app. An important difference between ViewPager and Workspace is that ViewPager pulls its views from an adapter, so like with a ListView as the items are slid off the screen they can be recycled and/or brought back in on the right side of the screen. The sample code for ViewPager shows this being done with a FragmentPagerAdapter, where each view is a fragment, giving you an amazing amount of control over your application. 2) Create a new Android Project (I'm using Eclipse) and include the library. Properties -> Java Build Path -> Libraries -> Add External JARs -> android-support-v4.jar, it is in the install directory. 4) If you use ViewPager in an xml layout, be sure to use the full reference, e.g. 5) Create a PagerAdapter to serve up your Views to the ViewPager. The key methods to implement are getCount(), instantiateItem(), destroyItem() and isViewFromObject() here are my implementations along with some JavaDoc from the source. Note: It is up to the developer to add the views they are creating in instantiateItem() to the collection being passed in. The converse applies to destroyItem(), you must remove the item from the collection. The collection in this example is the ViewPager that is using the PagerAdapter. A more professional and complete example can be found in the Compatibility Package samples (in the install directory), where a FragmentPagerAdapter implementation is provided. Using fragments inside a ViewPager can provide much better structure to an application as each view has its own FragmentActivity. For most developers, taking advantage of the features of Honeycomb is also going to involve ensuring their app runs on tablets. It is one thing to do this right from the inception of an app or game, but often a much harder task to upgrade an already complete project to look great on larger screens. If your app has multiple views then you can utilise fragments to show more than one of them at the same time. If not then you can think about any other data or views that may be able to augment it, or possibly increase the size of some elements. 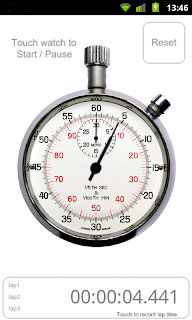 In the case of the Ultimate Stopwatch the counting digits clearly need to be larger, then the remaining screen space can be used to include an easier to access list of lap times and split times. I mocked up some wire frames and settled on the following design. So how do you make this magic happen? 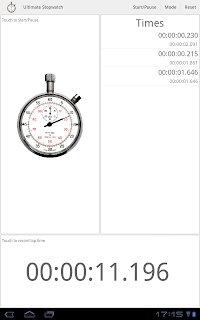 Well, as the Ultimate Stopwatch uses a SurfaceView and I spent so long getting the small screen UI right, I didn't really want to mess with it, so I'm going to leave it alone and just add new layouts for x-large devices. For many apps, especially those using standard layouts, it is less of an issue and the Android Compatibility package is the best option for a consistent application. I am however going to use fragments for the new layouts, to give me the best control over the larger screen whilst keeping my class files smaller. 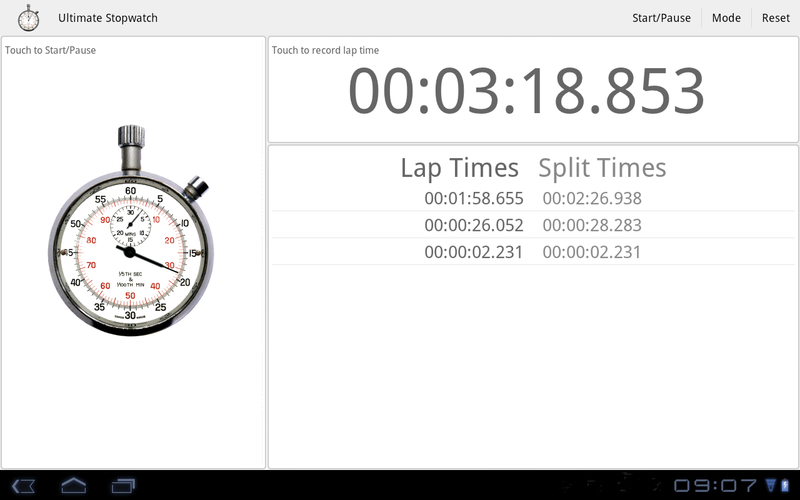 I'll have a fragment for the animated stopwatch view, one for the counter digits and one for the lap times. 2. Tell Android that your app is optimised for Honeycomb by updating the androidmanifest.xml by adding <uses-sdk android:targetSdkVersion="11" /> as per my last post, which also shows how to enable hardware acceleration for good measure. 3. To totally segment my previous code I created a new Activity which decides which version of the app to launch based on OS version and screen size, not forgetting to update the AndroidManifest.xml. 4. I've done custom layouts for both landscape and portrait to give optimal experiences. As I'd used fragments it made the portrait view much easier, it only took a couple of minutes. 5. Another thing to remember is that your menu items will now appear in the Action Bar. It is good practice to let Android know which items it can hide under the overflow button if necessary by appending android:showAsAction="ifRoom" in to the item in your Menu.xml. 6. When building the layouts and activities, be mindful of the fragment lifecycle, making sure to inflate your views in the onCreateView() method. 7. 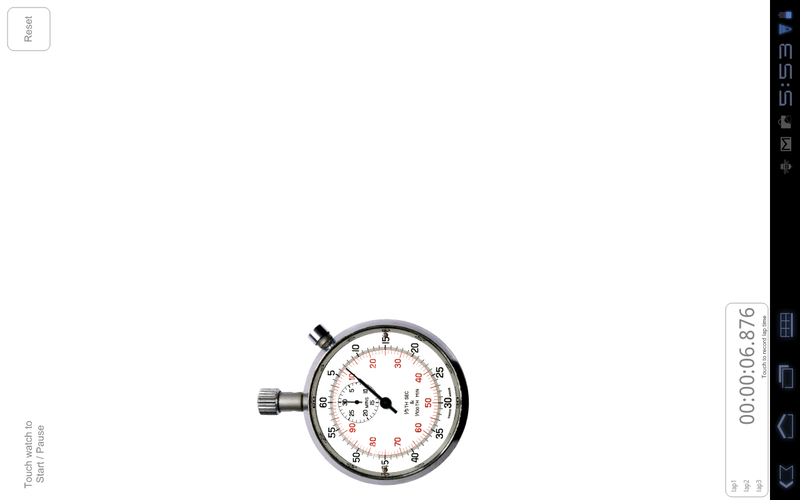 To add a little more Honeycomb goodness I also used ObjectAnimator to do a 180 degree animation on the lap times fragment when switching to Countdown Mode and back again, this hides the times and informs the user of the mode the app is in. 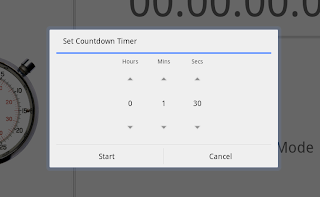 I also freshened up the Countdown time select dialog with the new NumberPicker. Launching this update was also a great opportunity to refresh the Android Market listing, adding new screenshots, featured image and descriptions. Follow me on twitter for further Android related updates.